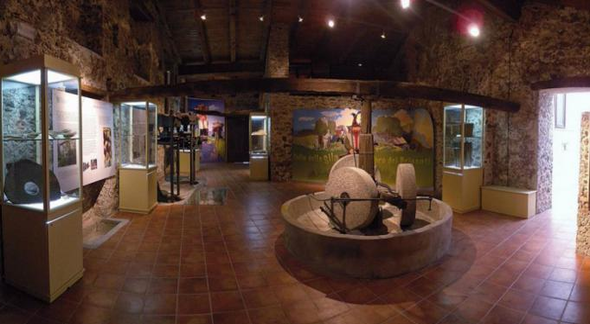 Created as a companion collection to the Wine Museum by Lungarotti Fundation, the Olive and Oil Museum is located in a small nucleus of medieval houses within the town walls. Olive oil as a significant element in cultural imagery, which has attributed it symbolic, propitiatory and curative values. On display are artworks and historical finds regarding the mythological origins of the olive tree, the use of oil as a source of light and heat, in religion, medicine and nutrition, in sports and cosmetics. 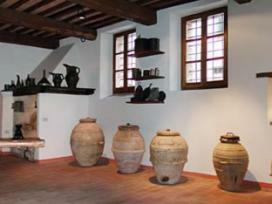 >> Come to Torgiano and visit the particular Wine Museum. Here you can find the best farmhouses! 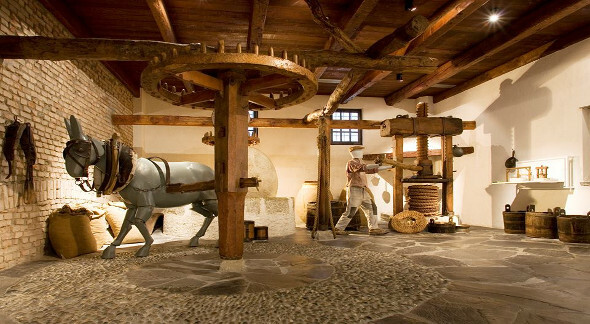 The museum covers ten rooms and opens with information provided by the National Research Council on the botanic characteristics of olive trees, the most common cultivars in Umbria, traditional and avant-garde techniques for cultivating and extracting the oil. The subsequent rooms, that were once the home of an oil mill active until a few decades ago and graced with a large fireplace, have a rich documentation regarding the history and evolution of olive oil equipment: from the first stone mortars of the 5th millennium B.C: across the centuries to the introduction of the trapetum, the large vat of probable Greek origin adopted by the Romans, up to the most complex machines using animal or hydraulic traction, to the invention of the continuous cycle which heralded the new olive oil technology. The museum continues on the two upper floors showing the presence of oil and olive trees in daily life, as well as the use and value attributed to them over time. These themes are documented in sections regarding the mythological origin of the plant, the use of oil as a source of light, in the rituals of the great monotheistic western religions, in medicine, in nutrition, in sports, in cosmetics, as a source of heat and as a significant element in popular imagery which has attributed and in part still attributes, symbolic, propitiatory, apotropaic and curative values to the plant and to the product of its fruit. Room V, dedicated to Athena, the goddess who reputedly gave the gift of the olive tree to man, displays, alongside various objects that recall the goddess's attributes, a precious Attic alábastron in red-figure pottery, signed by the Foundry Painter and dating to the 5th cent. B.C. The vase, of extraordinary interest due to the artist's craftsmanship, depicts Athena in the act of receiving the shield with an owl design (her primary emblem) from the hands of the ironsmith who crafted it for her. In front of the alabastron, there is a trilobate oil lamp from the 7th cent. B.C., a superb example of Dedalic art representing the remote use of votive oil lamps, alongside a scientific text by Mario Torelli. The collection of oil lamps, ranging from the pre-classic period to late neoclassicism, has some noteworthy examples: from the Roman bilobate bronze lamp, damasked in silver and copper, to the small bronze Renaissance putto, to the two precious staircase lamps from the 16th century. Interesting due to their techniques and styles, indicative of a taste for the myths of antiquity and exoticism , the group of neoclassic includes display lamps including the "fiorentina" lamp in Murano glass to the "romana" lamp from the major silver and bronze workshops characterized by sculptures that are very popular at the time, such as Mercury running on the wind, or the Egyptian figure which recalls the Napoleonic campaigns. Oil cruets and sauce boats, ampoules for perfumes and ointment, the Egyptian unguentary vase dated 1500 B.C. braziers and warmers, learned texts and popular handicrafts show the many uses of oil over the centuries. At the end of the museum a hallway of proverbs and sayings related to olive oil leads the way to a large painting depicting a field of olive trees in the wind, indicating the attention to the landscape which underlined the research leading up to the museum's creation. >> There are many offers to stay in Umbria and in the area of Torgiano, discover them now! NB: The Museum is closed on 25 December.